Join us for an intimate evening of music and growth as some of our younger and newer music therapy clients showcase their progress and work through original artistic creations or choosing songs and music that are meaningful to them. The event is FREE! Celebrate with our clients and their families as they showcase their progress and music therapy accomplishments through performing original artistic creations or choosing songs and music that are meaningful to them. Our recitals focus on creating an outlet for self-expression, joy and connection to others in a safe space to allow our clients opportunities to push themselves further in their goals, provide an outlet for them to feel validated and supported by the audience, and offer a chance for the audience to transform their perceptions of themselves and others. Don’t miss this opportunity to Experience A Place To Be! FREE Admission. 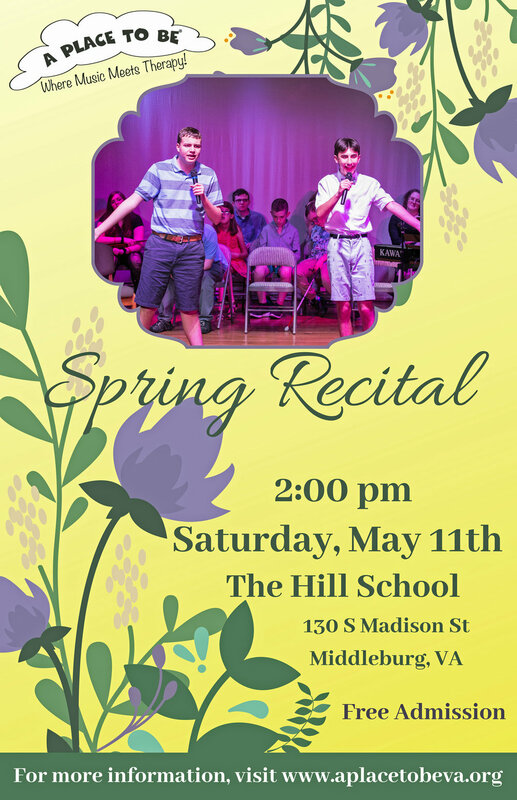 Join the Inova Stoke Survivor Choir, Different Strokes for Different Folks, for its annual community spring concert. “Hot Stuff” and “Dancing in the Moonlight” are just a couple of songs on the ticket for this upbeat concert full of 70s music. Come have some fun, and experience the benefits of music therapy. the event is FREE! Join us for the culmination of our summer Musical Theatre Camp as we present Holy Cow! An Udderly Amazing New Musical. More than 40 campers will come together to showcase their work with music, dance and beautiful costumes and sets. Experience the magic of A Place To Be, support your community, and learn more about music therapy all while being entertained! Tickets are $10 at the door. Friday June 28, 2019 7:00 p.m.
Saturday June 29, 2019 7:00 p.m.
Sunday June 30, 2019 2:00 p.m.
*This show contains mature language. Not recommended for children under 17. 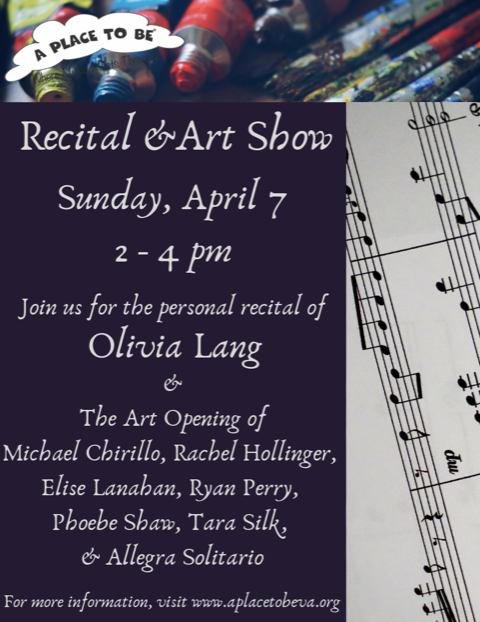 Join us for the personal recital of Olivia Lang and an Art Opening for Michael Chirillo, Rachel Hollinger, Elise Lanahan, Ryan Perry, Phoebe Shaw, Tara Silk and Allegra Solitario. Event is FREE. Art will be available for purchase. Join us for a conversation on accessible housing options in Loudoun County. Our Co-founder, Kim Tapper, will be joined by special guests with expertise in local residential options. The event is free but RSVP is required to Sierra@aplacetobeva.org to save your space! Abira and the Mountain is A Place To Be's newest original family production of a fairytale about acceptance, empathy and love. Abira is a princess in a wheelchair who is strong, innovative and beautiful, but she often feels secluded and lonely inside the castle. One day she decides to travel through her kingdom to see what she’s been missing. There, she meets others with disabilities, mental health and life challenges, and she discovers that she can use her own life experiences to help them live better lives while also increasing her own self-worth. 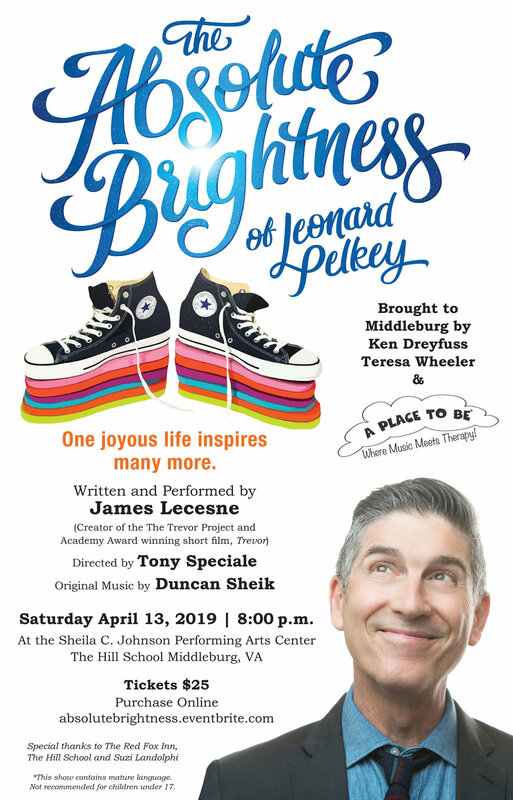 The original musical, written by and starring A Place To Be’s Ryan Perry and Amy Stone is currently touring Loudoun County Middles Schools as part of The Same Sky Project. Same Sky Project productions, have delivered messages of hope and resilience through staged productions to Loudoun County’s public schools for the past seven years. This performance is sensory sensitive. Join us for a special Parent Forum with A Place To Be Co-Founder, Tom Sweitzer, MMT, MT-BC. The parent forum is open to parents of clients 12 & up and will include discussions on the impact of music therapy on our individual clients, the growth of music therapy nationwide, and how our music therapy services are being used. The event is free but please RSVP to Sierra@aplacetobeva.org to save your space! Enjoy a beautiful evening of dance knowing proceeds from the show will benefit A Place To Be and Darby's Dancers. Tickets are $25/adults, $15/ages 3-18 and are available online and then at the door. Purchase Tickets Now (Scroll to state of Virginia, the event can be found under Ballet Theatre of Ashburn). Please join for a Sweet Valentea Open House! We’ll have the Just Flow Heart art exhibit by Carla Hakim O'Brien on display and a Heart Flow painting station for kids. We'll be listening to our new Someone Big album to be released March 1, 2019, and enjoying love songs performed by A Place To Be clients. And of course we’ll be serving tea, strawberry lemonade and incredibly delicious tiny tea sandwiches and sweets provided by Lori Price! The event is free but please RSVP to Sierra@aplacetobeva.org to save your space. Come and experience holiday music like you never have before. Join the Inova Stroke Survivor Choir, Different Strokes for Different Folks as they present A Holiday Recital. Admission is FREE! The Stroke Comeback Center in partnership with A Place To Be presents Mind Matters. featuring Keynote Speaker, Kathleen Howland, Ph.D. Kathleen, a nationally renowned lecturer, clinician, teacher and advocate professor of Music Therapy at Berklee College of Music and a consultant at A Place To Be, will speak about venturing the gap between music, science and wellness and how to unlock the beauty and power of music and apply these tools to our everyday lives. This informative and engaging event includes a seated luncheon, presentation and performance by local stroke choir, Different Strokes for Different Folks. A Place To Be's newest original family production focusing on acceptance, empathy and love. Don't miss your chance to see Abira and the Mountain which will tour Loudoun County middle schools as part of The Same Sky Project throughout the fall. Tickets $10 at the door! A MOTHER'S WILL tells the story of Ann-Charlotte Robinson, an inspiring woman that takes the stage in a production based on her son's suicide. Created by Tom Sweitzer and music therapy non-profit A PLACE TO BE, the rock opera A WILL TO SURVIVE was performed in front of thousands of high school students and on the Kennedy Center stage. The stage production spread a message of hope and encouraged young people to reach out in times of need. This locally-produced documentary short will be followed by a live music performance and a Q&A. A Place To Be performers are debuting at the Creative Cauldron venue in Falls Church, VA with another original production, Coming of Age, a cabaret addressing the important issues of teens and mental health. Join us for a night featuring songs about the struggles that teens go through, from anxiety, bullying and depression, to having that uncomfortable talk with your parents about romantic intimacy. Recommended for families with high school freshman and older.